There’s no credit check and no hassle. Just complete our online application and get approved for an auto loan in 48 hours or less. And then, congratulations — you’ll be driving around in Fredericton with your own car. Access to Fredericton’s best auto loan rates. What are the minimum requirements to qualify for a car loan in Fredericton? You need to be 18 or older, a Canadian resident, and fully licensed. You also need employment income of at least $1,500 per month. My credit score is really low — will I still be eligible for a car loan through your site? Of course. That’s the goal of our service: to make it easier for drivers with bad credit to get the auto financing they need. As long as you meet our car loan requirements (listed above), we’ll match you with an auto dealer based in Fredericton or wherever else you live in New Brunswick. Can I use my new car loan to pay off an existing loan on another vehicle? No. The car loan you get approved for through our site can only be used to purchase a car, not to refinance a car you already have. Does HST apply to used car purchases? Yes. Sales tax applies to both used and new car purchases in Fredericton. As of July 2016, the sales tax rate in New Brunswick is 15% — the highest in Canada. Do you work with specific auto dealerships in Fredericton? Yes. We work with an exclusive network of licensed dealerships located in Fredericton and throughout New Brunswick. All the dealerships in our network specialize in car loans for Canadians with impaired credit (or no credit at all). So don’t worry — the dealership you’re matched with will always be a good fit. Does the length of my car loan term affect my monthly car loan payments? Yes. The longer your car loan term, the cheaper your monthly payments. And the opposite is true for shorter car loans. Longer car loan terms (48 months or more) break your principal balance (amount owed) into smaller payments, but you also have to make more payments — and you’re charged interest on each payment. 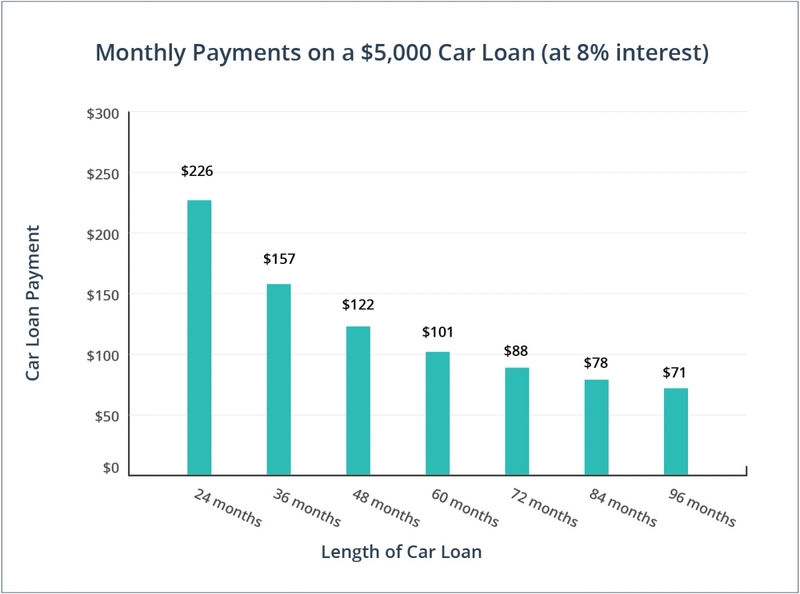 Check the graph below to see how a car loan term can affect your monthly payments. A shorter term forces you to make bigger monthly contributions toward your loan. And that’s a good thing. You’ll quickly pay off your car loan debt and reduce the amount you have to spend on interest. Avoid a situation where you’re still paying off your car loan after you’ve moved on from the actual car. For example, if you plan on replacing your car after 4 years, don’t spread your loan across a 6-year term. Get to know the car you’re interested in. Check its safety ratings, get a car insurance quote, and read consumer reviews. If you still want to buy it, get an inspection from a qualified mechanic. Some Fredericton residents are eligible for an HST credit. If you’re getting a credit this year, earmark that money for your car loan payments or other car ownership costs (gas, insurance, repairs, etc.). Getting a bad credit auto loan will further damage my credit. False. As long as you consistently make your payments on time, your credit will not be damaged by getting a bad credit auto loan. A record of good payment habits will actually help you repair your credit. Car loans for brand-new vehicles tend to have higher interest rates. False. Actually, car loans for used cars have higher interest rates. That’s partly due to the fact that used car buyers often have lower credit scores and therefore pose a greater risk to lenders. It’s always cheaper to buy a vehicle privately because there’s no sales tax. False. There is tax on private vehicle sales in New Brunswick. If you buy a car privately, you’ll have to pay 15% PVT (Provincial Vehicle Tax). It’s hard to get an auto loan for a used car. False. In fact, the process is just as easy as getting an auto loan for a new car. Actually, the process is pretty much the same. New Canadian residents living in Fredericton won’t have trouble buying a car — you don’t need any credit history to qualify for a sizeable auto loan through our service. A generous tax credit is coming to New Brunswick in October 2016. That means qualifying Fredericton residents may have a little extra cash to put toward a car. In 2015, New Brunswick reported the second-highest number of vehicle registrations in the Maritimes, with 554,368 new entries. Nova Scotia, in the number one spot, had over 600,000 registrations. Good news for electric vehicle drivers or hopeful buyers: Fredericton currently has 4 EV charging stations, including one at city hall.